PROPEL is an organization dedicated to helping the women of our Community discover a profession, enroll in a certification course, and cover the cost of tuition to generate higher income. Who is the PROPEL woman? “She may never have worked a day in her life, she may be stuck in a dead-end job with no opportunity for growth, and she may or may not have gone to College. Enrolling in a certification course is our way of helping her get the training she needs to get the job she wants,” says Florence Labaton, Executive Director of PROPEL. When a woman calls PROPEL she schedules an appointment to meet with a Certified Life & Career Coach. She works closely with the coach to assess her needs and strengths to determine the best course of action for her. Once they decide on a course, PROPEL will enroll the woman and coach her the whole way through. It is not uncommon for women to be fearful of entering or re-entering the workforce and enrolling in a course. Working with a Career Coach can alleviate a lot of that fear and offer support to the woman taking control of her financial destiny. “Women want to contribute to their family’s financial well-being.The question is, ‘What can I do?’ ‘How can I do it?’ PROPEL provides productive strategies for women to develop an effective plan. Providing women with support as they navigate school and start a new job makes all the difference,” says Certified Life & Career Coach Ellen Ades. “Being able to take care of the people they love and supporting their households financially is an incredibly gratifying feeling of accomplishment for our women. It is also a great example to show children that in times of financial hardship a family will pull together and do whatever it takes,” says PROPEL Director of Administration Viviane Darwish. Behind the scenes at PROPEL you will also find a very passionate and active Board of Directors comprised of Community men and women working together to ensure the success of every PROPEL client. “Way back in the 80’s when I was graduating High School, it seemed that most of our Community girls were not being encouraged by either their parents or the guidance team to go to college to learn and graduate with a particular skill. We were expected to get married young, and cook and raise our kids (not that there’s anything wrong with that! ), but I now see a whole generation of women my age who would like to earn extra income but have absolutely no marketable skills. As a board member of PROPEL, I feel so fulfilled knowing that our efforts can help so many women proudly use their talents to help provide for their families,” says Board Member Marlene Mamiye. “I believe it is my duty as someone that spent many years in the professional workforce and as community woman to ‘give back’. And what better way to ‘give back’ than to help and watch the women of our community flourish with confidence, professionalism and a sense of achievement. PROPEL is set out to do exactly that. The gratification that I feel when watching each Propel candidate smile and radiate with self esteem instills in me a great sense of happiness,” says PROPEL Co-President Jacqueline Harary. 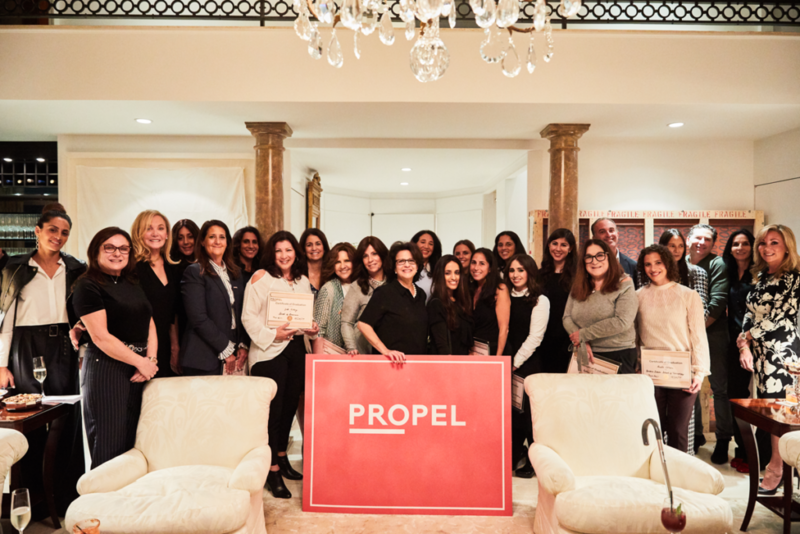 In a short time, PROPEL has already graduated 44 women from certification programs. Collectively, these women are expected to earn 1.4 million dollars in their first year working, which will help alleviate the financial pressures on our community and our community’s families. Women have graduated with certifications in a wide variety of fields such as Paralegal, Coding, Graphic Design, Cosmetology, Yoga Instruction, Teaching, and the list goes on. Thinking about taking control of your financial destiny? Take the first step. Call PROPEL at 646-494-0822 and make an appointment to meet with a Career Coach today.